Please Recommend me Headphones! Im noob at this. what kind of music do you like to listen to? do you need it for home use or for portable use? What other equipment will you be pairing it with? Are you looking for headphones or earphones? Have you tried in-ears before and are you comfortable with them? $400 is a goodly amount of money and can get you a very good set of earphones/headphones. Conversely, it's also possible to way overspend and get something that's not suitable for your needs. 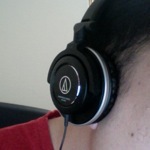 Did anyone notice if the Audio-Technica A or AD series is on offer? COMEX starting tomorrow... Anyone know any good audio deals there? I know Senn and AT are having booths - will there be bargains to be had? not sure if forum etiquette abt prices has changed... in any case, I paid less than $70 mind you though, these are by no means audiophile quality, but should be good enough for listening while on the go. burning the babies in as I type. The bass seems a bit... 'wild' at the moment. Hopefully it'll tighten up as the drivers get some exercise.